Using jjplot to explore tipping behavior | Please Scoop Me! In this post, I’ll show off some recent changes to jjplot that we think are really cool. To help motivate these changes, I’ll walk through them using the tips dataset included with the reshape package. Improved faceting along multiple dimensions. This shows a scatter plot of how much males and females tip on each day of the week, along with a best-fit lines. 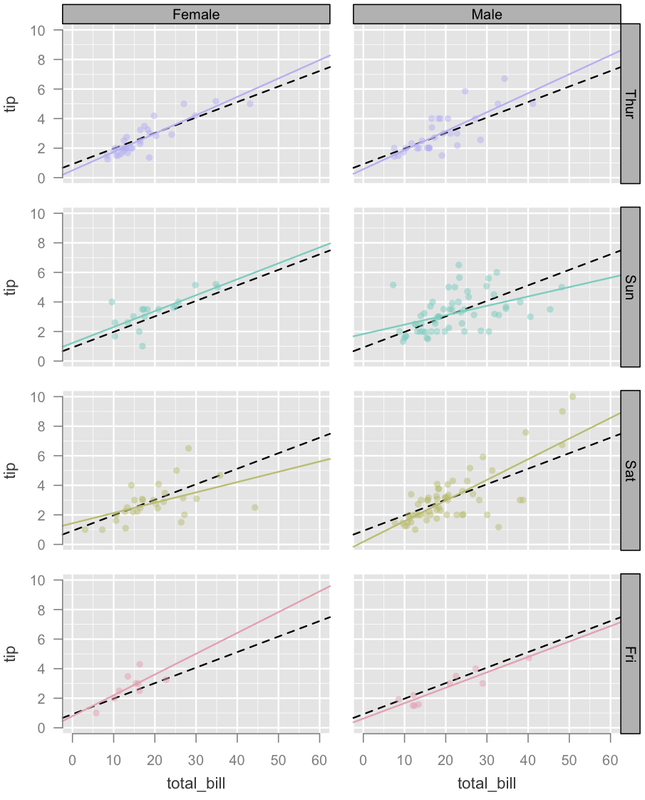 The black, dashed line shows the best-fit across all data points. Points/lines are otherwise colored by day. I’ll leave it to you to guess why the slope is higher for men on Saturday, but lower on Sunday. New stats/geoms such as area/density. 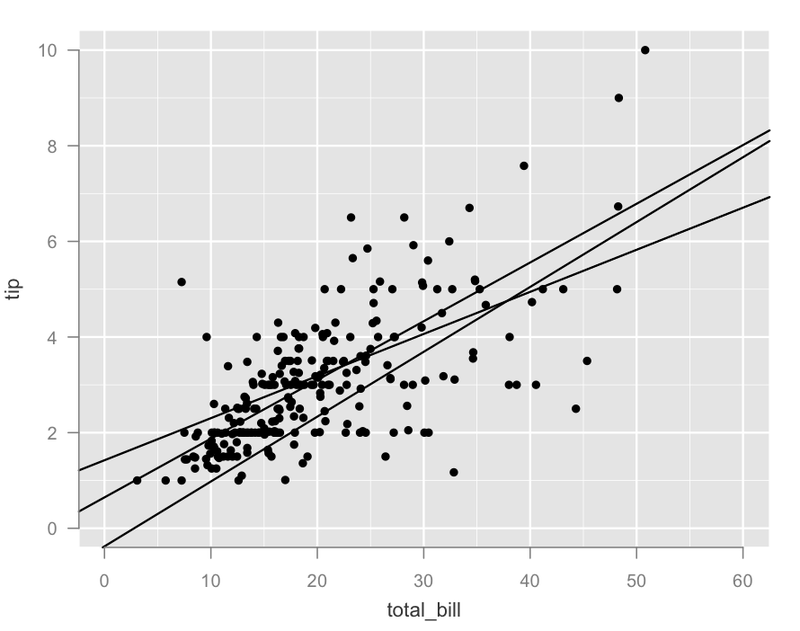 Here we’ll make a density plot of the tip fraction, that is, the tip amount over the total bill. The black density shows the overall density, while each each overlaid density shows the density just for points in that panel. Custom geoms/stats. We want to make it easier for the community to augment the system. Right now, the syntax is still sort of opaque and we’re working on it, but you can already get a custom stat just be naming your function jjplot.stat.*. For example, below we define a new kmeans stat. We then cluster the points and draw a best-fit line for each cluster. Coloring on derived statistics. You may have noticed in the earlier examples that the color syntax has changed. We figured color should be kind of like sort — it’s a pseudo-statistic which can be inserted anywhere in a statistics stack. This means that it becomes easy to color based off of derived statistics. 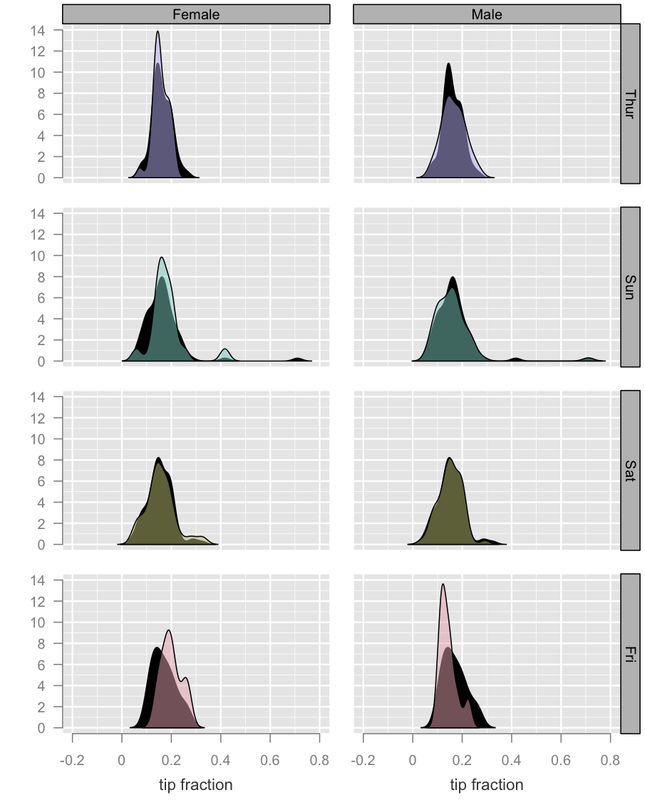 In this example, we make the previous plot much more useful by coloring the fits and points according to the assigned cluster. This is all very neat. Out of curiosity, are the performance benefits of jjplot derived from memoization, or are there other things at work here? It’s not ffplot or ggplot3 because it’s not a successor to ggplot2. I should also note that jjplot is more fun to say and it has nothing to do with Jon being a narcissist. Update?! I just ran across jjplot, made my way to the Rforge site, and saw that commits are still happening (less than 30 minutes ago, in fact!). Any word on future or immediate prospects for jjplot? 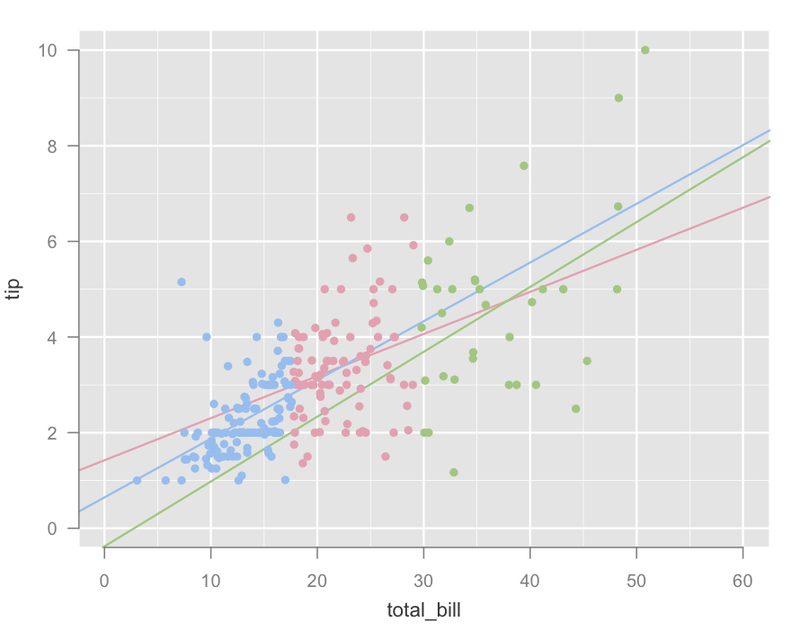 Thanks for the tips on ggplot2. Hadley tells me that there have been some improvements in ggplot2’s performance so I should re-evaluate at some point. And yes, jjplot is still being developed. It’s pretty stable and I’ve been using it day to day without problem (the occasional commit is usually me trying to fix an immediate bug). I encourage you to give it a whirl! is jjplot still being developed?? Lightly developed. I add features when I need them but I’m pretty happy with what I have so far. It’s not on CRAN; it’ll probably stay on R-forge for a while longer since CRAN has rather exacting standards. I moved this to r-forge at some point (it is here: https://r-forge.r-project.org/R/?group_id=835). The docs haven’t been updated unfortunately but with any luck the demo should still work and serve as a good starting point for learning how to use it. I will add a TODO to add more docs! > ## Heatmaps with tile. PS: Say hi to Cameron. Ah, I guess you need to require(MASS) for that one to work. Also clearly jjplot needs some love =/.